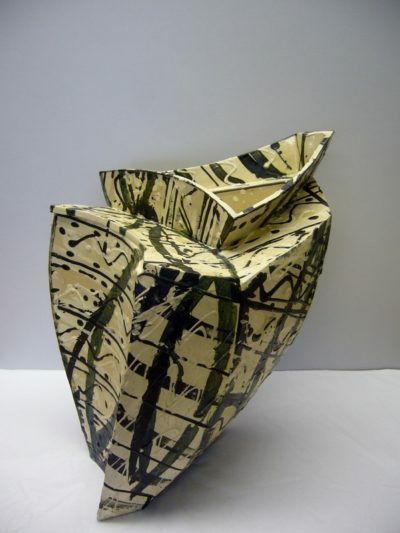 Alison Britton OBE (born 1948) is one of the UK’s leading ceramicists. 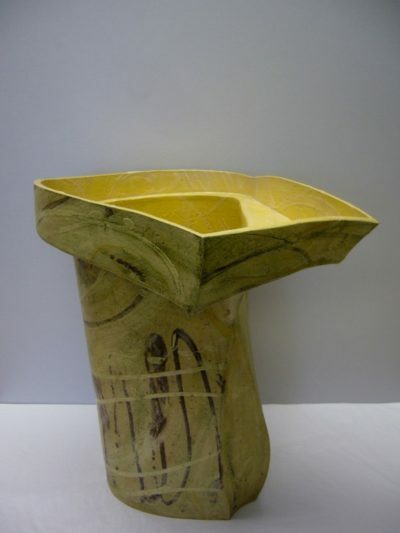 She was part of a group of radical artists (along with Elizabeth Fritsch, Carol McNicoll and Jacqueline Poncelet) graduating from the Royal College of Art in the late 1970s who began working on re-establishing the ‘vessel’ as an abstract form. 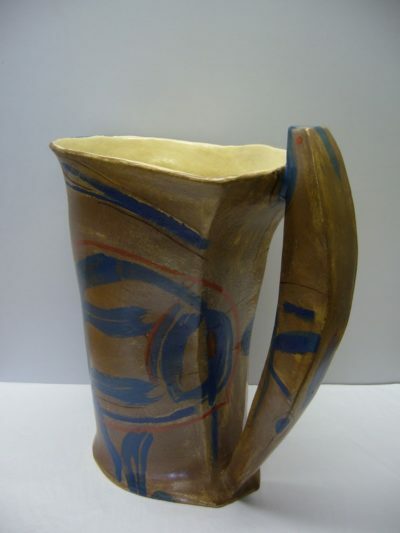 They took their inspiration from Gordon Baldwin and Hans Coper, moving away from the Leach school of Anglo-Oriental ceramics towards a more modernist aesthetic. 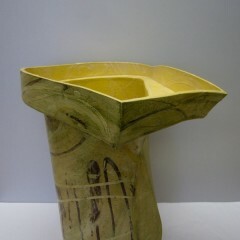 In her work, Britton explores the pot as a form and its relationship to function. 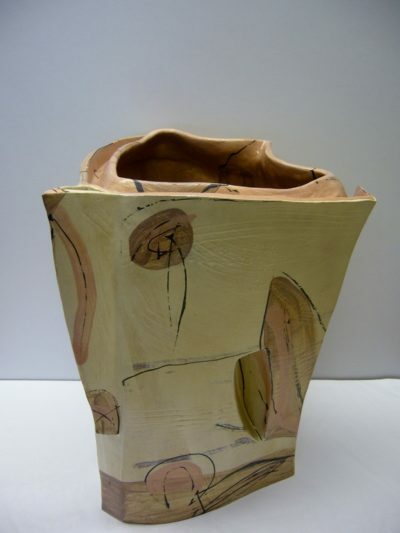 Her forms have a loose connection to function in that they are containers, but often their size, lack of handles or double spouts render use in the traditional sense difficult. The surface is treated as a three-dimensional canvas with decoration applied in an abstract and painterly manner, with a limited palette of pigments. 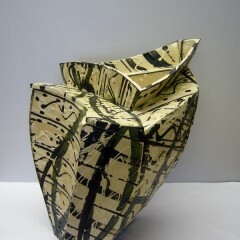 She is interested in the control of skills, materials and pigment and the subsequent value on imperfection. 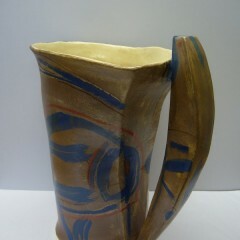 Britton also writes and has taught at the Royal College of Art since 1998. 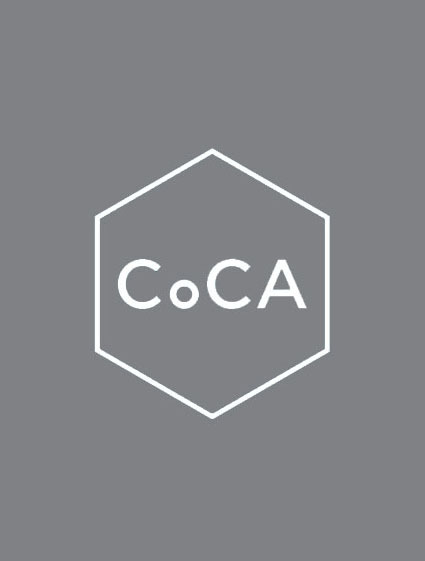 Curating exhibitions has also become part of her practice, having curated the critically acclaimed ‘The Raw and the Cooked: New Work in Clay in Britian’. 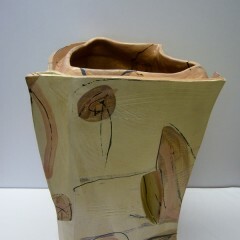 Images: top left – Big Pot with Collar, top centre – Brown Jar, top right – Leaning Black and White Pot, bottom left – Pink and White Pot.